Burglaries happen in all seasons but to be burgled during the festive season can be devastating. The Acton Safer Neighbourhoods Team were out last Saturday in Morrison's car park giving advice on crime prevention during the holiday season. 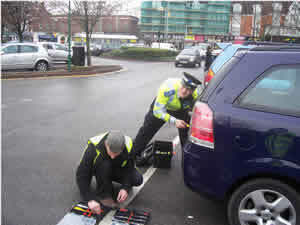 The team were also fitting anti theft screws to car number plates following a rise in number plate thefts in the area. Over 20 cars had number plate screws replaced by the team. Sergeant Mark Pullen said "We are happy to attend residents homes. If you would like a crime prevention visit please email ActonCentral.snt@met.police.uk or call the team on 07879694811." Here are Sgt. Pullen's Top Tips to prevent home burglaries.